How a New England Port City Became the Site of the Revolution That Changed the History of the WorldIn 1760, no one could imagine the American colonies revolting against Great Britain. The colonists were not hungry peasants groaning under the whip of a brute. They lived well. Land was cheap, wages were good, opportunities abounded. While many colonists had been in the New World for generations, they identified with Britain, and England was still home. Yet in the space of just fifteen years these sturdy bonds snapped. Boston a town of just 16,000 lit the fire for American Independence. 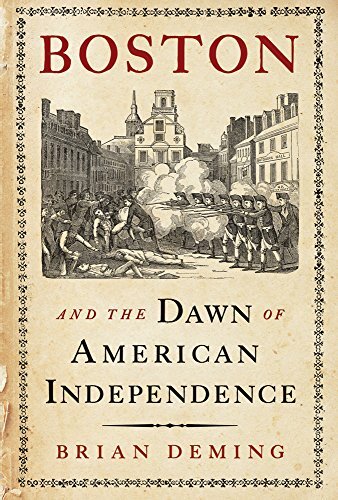 Brian Deming explains how and why in his lucid, lively, and deeply researched "Boston and the Dawn of American Independence." To dodge British taxes, Boston merchants for as long as anyone could remember had routinely smuggled in molasses from French and Spanish possessions in the Caribbean. Boston distillers transformed this sweet cargo into rum, the liquid gold traded around the world. But British authorities cracked down on smuggling and imposed the Sugar Act to help pay for the debts incurred during their wars against France. Then came the hated Stamp Act, a tax on documents, newspapers, and printed materials of all kinds. In courtrooms, in the press, and in the streets, Bostonians rallied in protest against taxation without representation. As anger swept America, Boston was at the center of the storm, which burst forth with the infamous massacre and the Boston Tea Party. By 1775, open warfare erupted at Lexington, Concord, and Bunker Hill. "Boston and the Dawn of American Independence" ties these scenes together with the people of the time, including John and Sam Adams, John Hancock, and Paul Revere, as well as Thomas Hutchinson, the beleaguered Massachusetts royal governor, and James Otis, the bombastic, unstable early patriot. Readers hear their voices, but also those of many amazing, colorful, and memorable personalities feisty mob leaders, defiant Tories, terrified townspeople. Deming illuminates this epic story with views of everyday life inside taverns, outside newspaper offices, and along the wharves, and the political dramas in London and Philadelphia that shaped the destiny of an empire and gave rise to the world s first modern democracy." BRIAN DEMING, a graduate of the University of Michigan and Northwestern University, was an award-winning newspaper reporter and columnist in Michigan and Indiana. He is the author of a number of books, and now lives in Toronto where he works as a freelance editor.